We provide a wide range of homecare services directly to people in Weston Super Mare and the surrounding towns and villages. 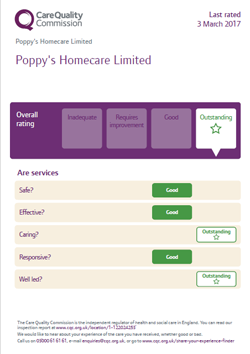 Poppy’s have become a leading light in domiciliary care and our reputation for delivering a high quality, caring service to a variety of clients is recognised throughout the local area. Our service could benefit you if you are recovering from an operation, have a long-term condition such as Parkinson’s, Multiple Sclerosis or Memory problems. We can also help if you have had a stroke, or have a terminal illness. We are also able to offer respite care, so if you are caring for someone who suffers with any of the above conditions and need a break we can help. We can help whether you have a personal budget or receive direct payments. Please call our office and we will arrange to discuss your requirements in the privacy of your home. Our assessments are free of charge. 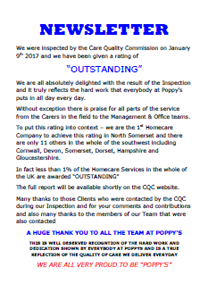 Poppy's Homecare Ltd is a wholly owned family business and is not associated, recognised or endorsed by The Royal British Legion. hospitals, care homes & care services.